Bone broth has great flavor and nutritional benefits, and many on the Paleo diet know that with the right grass-fed soup bones, it can be a very heartwarming snack.We decided to turn our broth into one of my all-time favorite dishes, Pho, a deeply flavorful Vietnamese noodle soup. A good Pho is a perfectly balanced dish with a rich, salty, and spicy flavor cut by a squeeze of lime and fresh herbs, and includes a remarkable variety of textures from crunchy bean sprouts to tender beef and chewy rice noodles. 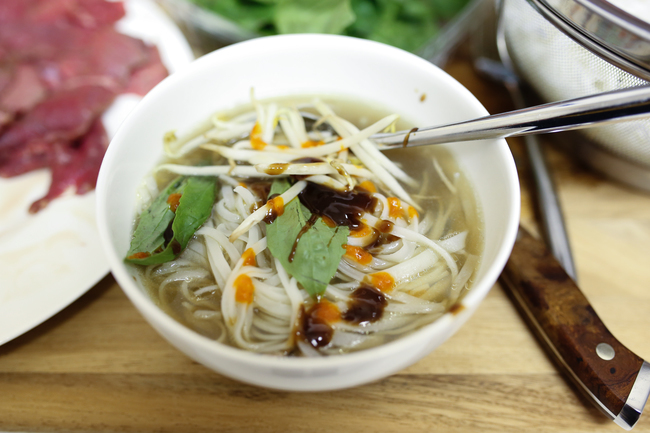 There is no better way to fight off a cold winter evening than a steaming hot bowl of Pho.Our recipe below is broken into 2 components: the beef stock and the Pho. Feel free to use the base stock in any recipe or as a simple soup on its own. Add all the accouterments for a delicious and hearty meal. Heat oven to 350 degrees. Place onion and ginger on rimmed baking sheet; roast until onion is soft, about 1 hour. Remove from oven; cool. Peel, then halve onion. Slice unpeeled ginger into ¼-inch thick coins. Meanwhile, prep the bones: To ensure a pot is large enough to blanch the bones without boiling over, put all bones except marrow bones in a large pot with enough water to cover by 1 inch. Remove bones. Heat water to a rolling boil. Add all bones except the marrow bones to the pot. Return to a boil; boil 3 minutes. Drain pot’s contents into a colander; rinse under cold running water. Rinse pot; add rinsed bones and marrow bones to pot. Add onion, ginger, sugar, salt and 8 quarts fresh water to pot. Heat to a boil over high heat; skim off any foam. Lower heat to a simmer; simmer, skimming as needed to remove surface scum, 4 hours. Add pepper, cinnamon, star anise, clove and cardamom. Continue simmering and skimming, 1 hour. If you wanted to do it with different herbs and spices, feel free to substitute. Remove from heat. Using a slotted spoon, discard large solids. Strain stock through a fine-mesh sieve into a large container. Allow to cool. Refrigerate overnight. The next day, skim off most of the surface fat (there will probably be a lot). Leave some fat to give the stock better flavor and mouthfeel. Store in airtight containers up to 3 days in the refrigerator or up to 3 months in the freezer.